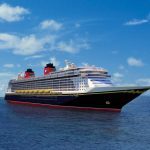 Out with the New…in with the Old!!! 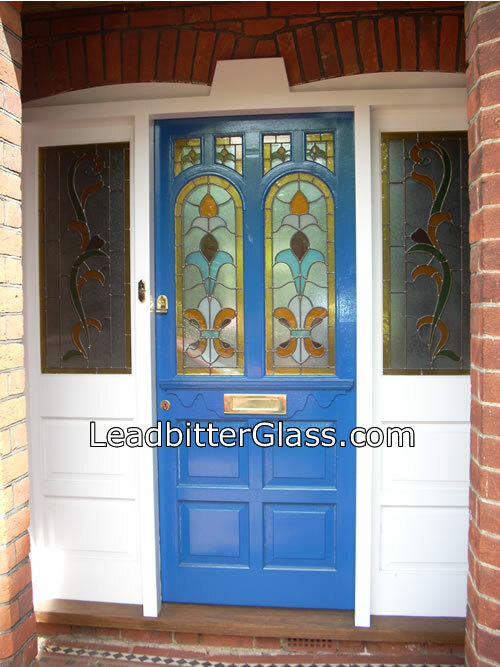 Yes you have read it correctly…Leadbitter Glass recently created a beautiful Victorian Stained Glass style door glass set to help bring a clients home back to its former beauty. Mr & Mrs Fox from Bedford bought their elegant home recently but did not like one of the 1990’s so-called ‘home improvements’ that was made to the home by the previous owner – this PVC door. This PVC door did not fit in with the traditional look of the home and Mr and Mrs Fox made it a priority to replace this focal point of their home as soon as possible. 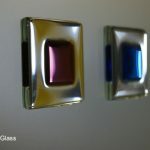 Going back to the ‘good old days’ of elegance and quality does not mean that your home has to suffer with glass and door frames that are not energy efficient. 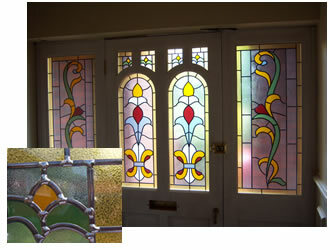 The new double glazed door glass was created using toughened Pilkington K Glass designed and supplied by Leadbitter Glass and an energy effiecient door frame supplied by a local joinery company. 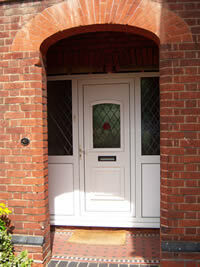 The whole door was manufactured to meet today’s strict building regulations. 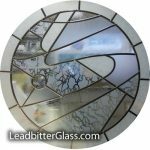 The first thing we did at Leadbitter Glass was to listen to the client and discuss their ideas and goals for the project. 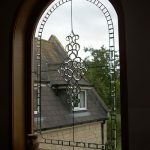 Mr and Mrs Fox supplied a photo of an original stained glass door set and we went about creating an exact scale ‘proof’ for their new door glass. The design was uploaded to our Client Pages section of the website and after viewing the mock-up Mr and Mrs Fox made a few adjustments to the colours and the design was ready to go. 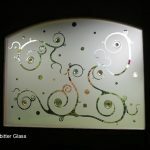 Mr and Mrs Fox wanted a door glass that was very original and colourful but at the same time, held a great level of obscurity. 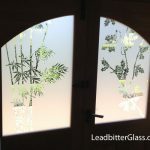 All of the colours of this design were ‘doubled up’ with an etched film called Sandblast to help take away some of the transparency of the coloured areas. 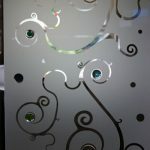 This was a great way of achieving a higher level of obscurity for the clients entrance way. 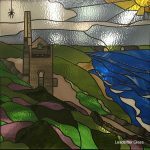 To keep in with the Victorian style of the home, all of the lead was soldered and aged to give the glass that ‘old’ appearance. 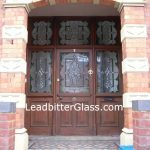 The doorway to this elegant home now blends in perfectly with the style of the building and Leadbitter Glass have helped create a centre piece that will not look out of place in years to come. 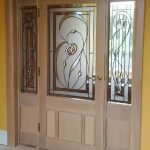 Gone is the ‘new but already dated’ diamond lead PVC door and in came this beautiful traditional doorway that really is the new focal point of this home. 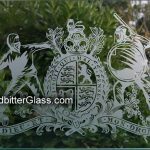 Leadbitter Glass can help you improve the look and value of your home or business with our decorative glass. 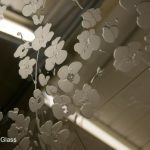 Visit our Executive Service section and also our Client Pages area to see how we can help you create beautiful glass that will enhance the appearance and energy efficiency of your home or business.